Newcastle United captain Alan Shearer is the Barclaycard Premiership player of the month for December. Shearer's experience and goals have been vital in taking Sir Bobby Robson's side into fourth place in the Premiership - and the Magpies are still fighting in the Champions League. He has produced some of the finest form of his career, prompting calls for him to come out of international retirement for England. 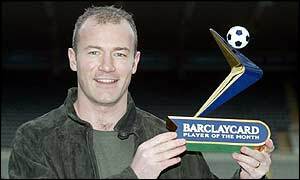 "I'm delighted, very pleased to accept this award," said Shearer. "It's not the first time I've had it, in fact it's the third. "But I just wish it was a team award because that would mean we had been successful." And Newcastle boss Sir Bobby Robson is in no doubt the award has gone to the right man. "I think he was the ideal candidate," said Robson. "You've only to look at his matches. He deserves it - he's hit some stunning goals." Shearer started the month with a wonder strike against Everton that set up a dramatic 2-1 win. It was a thunderous volley from 25 yards that he claimed could have been the best of his career. And he followed that up with the winner at Aston Villa as Newcastle's Premiership campaign gathered pace. Shearer also scored his 100th Premiership goal for Newcastle in the defeat at Manchester United at the end of November. The former England captain reached another landmark in October when he scored the 300th goal of his career when he was on target for Newcastle at former club Blackburn Rovers. Who will be player of the year?